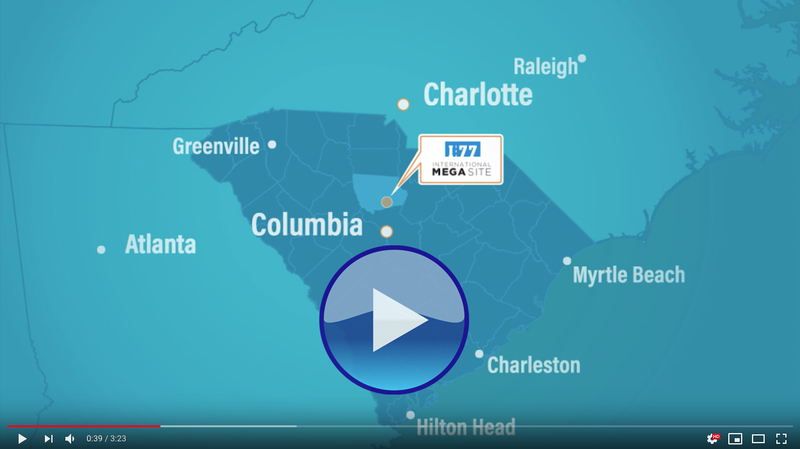 The I-77 International Megasite is now ready to be claimed by a major manufacturer that can bring 2,000 jobs or more to the property along Interstate 77 just north of Columbia, SC, and an hour south of Charlotte, NC. The 1,500-acre site was acquired recently by Fairfield County in partnership with the S.C. Department of Commerce and is designed for use by a single occupant. The master plan calls for more than 9 million square feet under roof, along with a rail spur, electrical substation, and million-gallon water tank. State and local officials are targeting their marketing of the International Megasite toward landing an operation such as a major automotive assembly plant looking to take advantage of easy access to multiple interstate highways, air hubs in Charlotte and Columbia, and the Port of Charleston. The site is about 20 miles north of Columbia and 60 miles south of Charlotte. A civilian labor force of nearly 850,000 people, and more than 20 vocational and technical training opportunities, are within an hour’s drive or less. “The International Megasite is ready to represent the next chapter in the Palmetto State’s record of building a major presence in the transportation manufacturing space, including automotive and aerospace. When this property is a thriving workplace, the benefits will be felt across South Carolina,” said S.C. Secretary of Commerce Bobby Hitt. “We’re excited to begin marketing the International Megasite. Competitive incentives, a ready and willing workforce and proximity to Charlotte and Columbia — both known for their outstanding lifestyle, entertainment and educational opportunities — is going to make this a great home for a world-class manufacturer,” said Rich Fletcher, President & CEO of the SC I-77 Alliance, which markets the I-77 corridor for Chester, Fairfield, Lancaster, Richland and York counties. 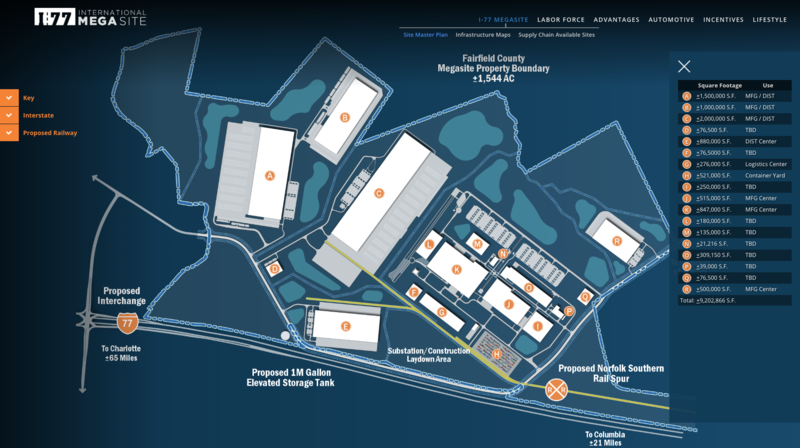 “The work to attract that one mega manufacturer for our Megasite is now officially under way. We’re thrilled about the potential impact this industrial development will have on our community and beyond,” said Ty Davenport, Director of Fairfield County Economic Development. 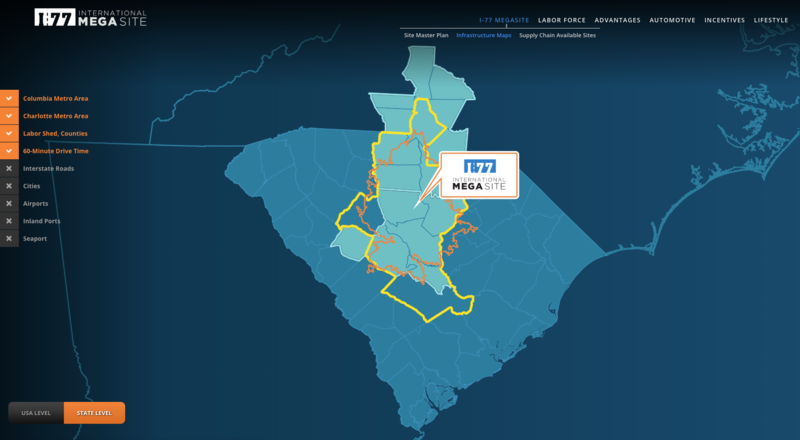 Visitors to www.i77megasite.com will find a master plan and infrastructure details about the site along I-77 near Exit 34. There’s also information about the available labor force, incentives, educational and lifestyle opportunities and other advantages awaiting the future occupant. 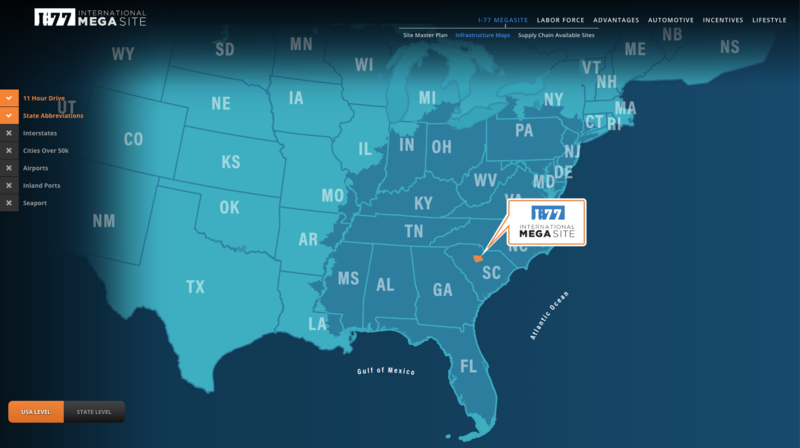 The I-77 International Megasite is located in Fairfield County, South Carolina, USA. Located off Exit 34 along I-77, this 1,500+ acre, industrially zoned and county owned site offers a proposed 9.2 million sq. ft. of space. Designed for use by a single occupant, the master plan calls for more than 9 million square feet under roof, along with a rail spur, electrical substation, and million-gallon water tank. For more information, visit www.I77megasite.com. Copyright © 2019 South Carolina I-77 Alliance, All rights reserved.